Home » Films » Comments from Larry Beinhart regarding forthcoming novel (including film deal). Comments from Larry Beinhart regarding forthcoming novel (including film deal). A Jew, Christian, Atheist and a Muslim become involved in a murder investigation. Sound like the start of a joke? It is the meeting of these different faiths that is at the center of the forthcoming Larry Beinhart novel. Salvation Boulevard tells the story of a P.I. (who is Christian) that is brought in to investigate the murder of a college professor (an Athiest). The D.A. is Jewish and the accused is an Islamic student. The film rights to SB were recently sold to Mandalay Independent Pictures, with George Ratliff directing and handling screenplay duties. Larry is no stranger to films, his novel American Hero was made into the critically acclaimed Wag The Dog (1997), a satirical look at Hollywood and American politics. 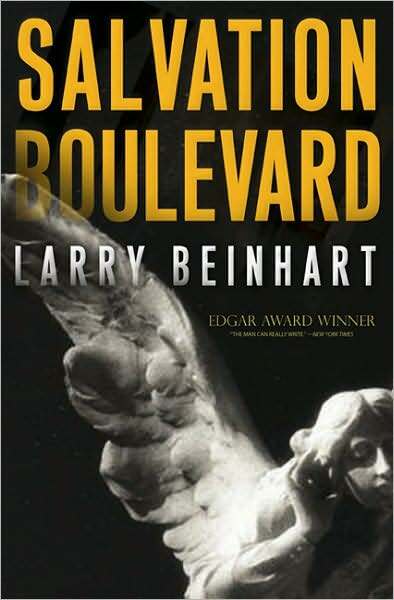 The process of writing Salvation Boulevard was not easy for Larry; he describes it as the hardest of his life. The original inspiration for SB came over twenty years ago when he was working on a television pilot bout a psychic detective. Larry felt he needed to do some research into psychic phenomenon. “I discovered, much to my surprise, that there was no single case ever solved by a psychic. Never. Not a single one. “At the same time I discovered, also to my surprise, that there had never been a single, verifiable demonstration of psychic ability. So how does this relate to religion and faith? “There is a long, long history of war, violence and oppression based on religion. “I am not one of those who thing that religion is greatest cause of such things. That’s obvious on the face of it. Or that abolishing religion will abolish war, violence and oppression. That’s demonstrably ridiculous. “The classical liberal solution to the problem of religion was to guarantee religious freedom. Full religious freedom, as a practical and realistic matter, requires separation of religion and the power of the state. After World War II this became the official, and very real position of the Western countries. The Communist bloc, which stretched from the middle of Europe to the Pacific was officially atheist and anti-clerical. Much of the rest of non-Communist Asia followed non-theistic religions and spiritual paths. “For about forty years religion lay quiet. “Then, almost simultaneously, Islam arose as a political force in the Middle East and Central Asia and the religious right entered the public sphere in the United States. “The two defining events of the start of the 21st Century became the attack on 9/11 by Islamic extremists and the response by a president of the United States who says that God told him to invade Afghanistan and that God was happy with that, He then said to invade Iraq. Knowing all of this, I was a bit surprised to find the novel’s protagonist to be a man of faith. This was not an accident. Larry attempted to write the novel five years ago, but had limited success. The key, he found, was putting a believer in the center of the story. “It was necessary to put someone who believed, who experienced the strength, even the salvation, that came from faith, at the center of the book. Before anyone jumps up, saying that the author is anti-religion, he does see good in it. “There is much good in religion. The book is strong, with complex characters and the subject matter is clearly challenging. I look forward to seeing what Mr. Ratliff can do with it. Personally, I know little about George; but his last film, Joshua, garnered a fair amount of praise and was nominated for the Grand Jury prize at the 2007 Sundance Film Festival. No word on a timetable for the film, but I will post more as I hear it. Salvation Boulevard (the novel) comes out on September 8th.